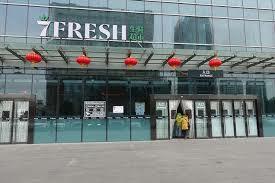 JD owned 7Fresh increases the race to introduce futuristic grocery stores aka ‘new retail’ in China. To no one’s surprise, the main contestants are the country’s e-commerce titans Alibaba and JD.com, which are turning to an offline strategy for growth. Online retail has flourished in China, but it still accounts for less than 20 percent of the nation’s overall consumption, according to the Ministry of Commerce. The goal of internet players is not to steal business from the offline counterparts, but to digitize old-fashioned merchants. Long before Amazon bought out Whole Foods for $13.7 billion last year, Alibaba was making offline forays by forging partnerships with a department store operator, an electronics retail heavyweight and more recently, a prolific hypermarket chain. 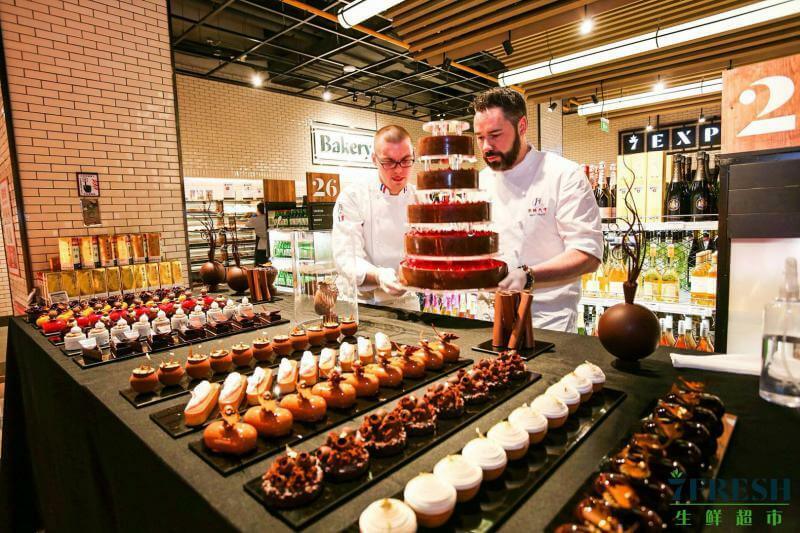 The purest manifestation of Alibaba’s physical push came in July 2017 when it rolled out Hema, a supermarket store that features cashier-less checkouts and a robotic restaurant at one branch. 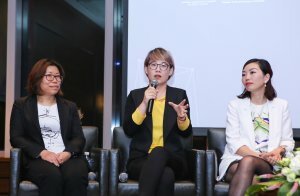 Since its inception, Hema has been rapidly expanding and now operates in 80 locations across China’s megacities, with the help of a few franchises. JD has been approaching “new retail” from a different angle: In August, Walmart and JD.com announced a $500 million investment in online grocery delivery Dada-JD Daojia. It seems that JD decided to go into offline stores more vigorously only after Alibaba’s own offline store Hema showed positive results. On September 18, Hema released its operation data for the first time. Its 64 offline stores across China have served over 10 million consumers and reached RMB 800,000 daily revenue per store. However, not much information was given on profitability. Meanwhile, even low-end e-commerce platform Pinduoduo is investing into grocery delivery. “JD’s online fresh food business provides an advantage in terms of merchandise selection when we’re expanding into offline retail,” JD senior vice president Wang Xiaosong said. Combining online data and offline retailing facilities has been the latest trend for Internet companies to drive further growth when online spending might be slowing down. JD adds that it chose to open the 7Fresh in Shanghai thanks to local residents’ purchasing power and the city’s potential to lead new commercial and retail businesses for nearby provinces and regions. Shanghai residents’ high disposible income and commercial infrastructure also offers development potential for JD’s retailing initiative. What Is The Inside Of The Store Like? The whole foods section is similar to Hema’s departments but with a few more additions. The fruit section lets you scan barcodes on meticulously wrapped items. Details of the fruit then pop up on a screen above your head stating the contents like where it came from, how sweet it is, netweight etc. Like Hema, 7Fresh doubles as a warehouse and distribution hub, and so it is larger than the old-fashioned grocers, which focus on capturing in-store traffic. There exists a ceiling conveyor belt just like Hema’s — though it still requires human help. Once a customer places an order online, an in-store fulfilment staff packs it up in a bag and loads it onto the conveyor belt. The item then zooms across the store over your head to a nearby delivery centre, a system that also powers Hema. 7Fresh shopping, requires you to download its app and register an account which is similar to Hema’s infrastructure. 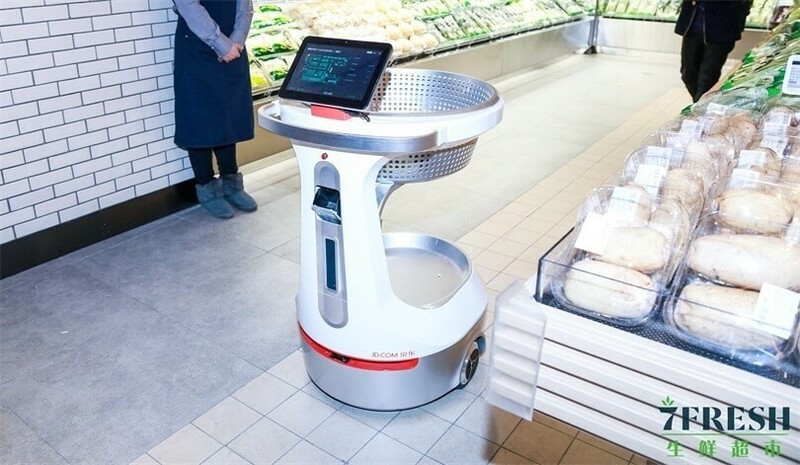 The implication is that shoppers will help themselves at checkouts with the presence of human staff on the loose to assist the less digital savvy. The new drill doesn’t come as a surprise to most Chinese people because they are already into the scan and pay habit. 7fresh expects the buyer to pay by scanning at the counter with WeChat Pay which happens to be the payment solution linked to Tencent, a major JD shareholder. The 7Fresh app, of course, also lets you remotely buy what’s in-store. Customers who are less than three kilometers away can buy online with 30-minute delivery. In other words, the supermarkets are not stuck with store visit conversions. New Retail Vs Borderless Retail? Jack Ma coined the term “new retail” to describe this new grocery market structure that included online-and-offline retailing integration, while Richard Liu’s equivalent is “borderless retail”. Besides the much-coveted customer insights, Alibaba and JD are going offline for cheaper user acquisition. “The golden age of cheap internet traffic is gone. Now it’s the opposite. 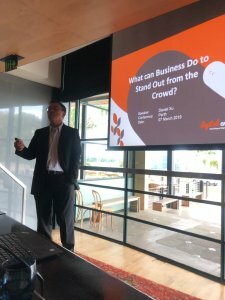 Customer acquisition is much cheaper offline,” suggested Zhao.